Jackie Kennedy was a woman of extravagance, indulgence and a quiet smokey intensity. Pablo Larraín’s film about the woman behind President John F. Kennedy shares a similar thematic allure bringing virtuoso filmmaking, an eerie score and the spectacular, no-holding-back performance of Mrs. Kennedy by Natalie Portman. This trifecta is bolstered by beautiful cinematography and a script so enigmatic and emotional by Noah Oppenheim that attacks the trauma of a nation through the needlepoint of the woman who tried to keep her composure after her husband’s brain was plastered across her fuchsia dress suit. The film approaches the material with a brutal and winding perspective that weaves a tragic look at the white house with the continued unraveling of psyche of the haunted first lady while balancing between a horror and accurate depiction of the time that Larraín crafts in a fuzzy and constantly moving frame. The cinematography of Stéphane Fontaine floats around the recreations of the white house and the family of Kennedy’s unable to solely rest on any character long enough to give closure. 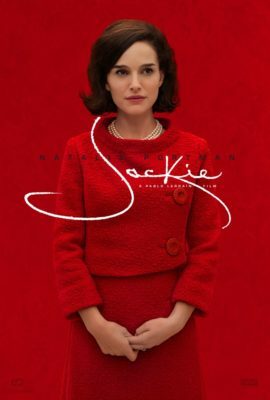 Its a kinetic way to frame such a well known story that lends the hyper-realized performance given by Portman a haunting-ethereal quality, that at times pictures Jackie as more of a walking corpse than someone still functioning. The film doesn’t need to but often ascends due to Portman’s soon to be iconic portrayal. Her whispered confusion and anger seems to boil under her glazed eyes presenting the most radicalized yet understandable version of grief, possibly committed to the screen. From the awkward white house tour to the funeral procession, Portman commands the camera to be for her as if Jackie herself needed it to keep going. Alongside Peter Sarsgaard and Greta Gerwig as Bobby Kennedy and Jacki’s friend Nancy Tuckerman, the performances gel together in such an unexpected way that they bolster the film to be one of the best ensemble casts of last year. Yet, it must be said that the overall film stands as the pinnacle of the biopic film by completely subverting all expectations usually associated with the genre. The non-linear structure and experimental violin based score by Mica Levi (who has previously worked on the spectacular music to 2013’s Under the Skin) that elevates the picture as being more of a time capsule of emotions and elements surrounding the assassination. Feeling more in line with a tone poem than a conventional film, it absolutely is must required viewing and a more than healthy future for the extremely talented cast and crew.